The arms are perfectly horizontal, an impossibility where a body is hanging by the straps that we see on his wrists. It appears that the photo is of a man lying on a street or other horizontal surface; the photo doctors cut him out of the photo, then positioned and pasted him vertically to an Arab-street scene somewhere. It evokes the faked photos of the Boston-marathon explosion. Note that there seems to be nothing behind the man's arms to which the straps are supposedly tied. They must have pasted in the straps too. Do you think that media people didn't notice the problem with this photo? Do we think that media people are all completely stupid? 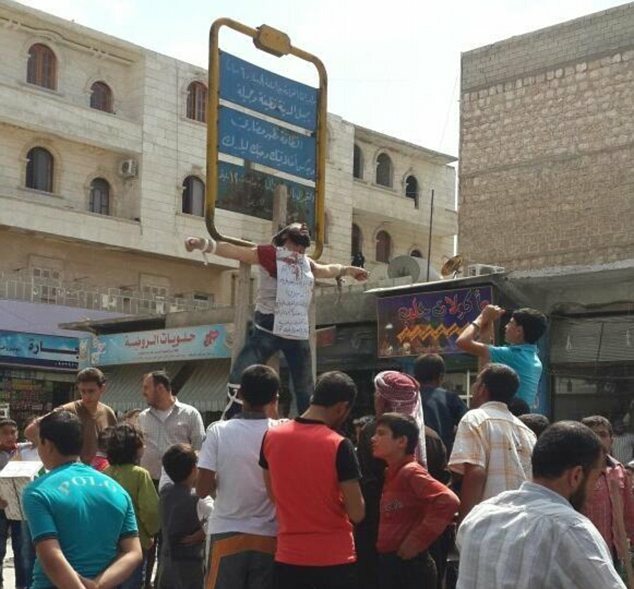 Of course they saw the problem, for any picture of any crucified person has arms sloping down on a significant angle (unless the arms are tied to a beam near the shoulders) Yet, don't hold your breath for any media to do a story on this problem. It's a bizarre situation. It's creepy. Intelligent people acting stupid. Inexplicable, unless the leading media is controlled by the globalists while the minor media play follow the leader. A major story for this week is that an Iraq government spokesman (Saad Maan) claimed that Abu Bakr Baghdadi had been seriously injured in an air attack by the Iraqi air force, although that's not the full extent of the story. Iraq claims that he escaped to Syria, but, careful, because Iraqi politics is such for Maliki that he needs a fabrication like this. The full extent of the story is that the injury or death was exactly at the point where Baghdadi appeared in his first-ever video, supposedly from a Mosul mosque. The Iraqi government denies that it's Baghdadi in the video. There are media games being played on us, and we would like to know whether they originate in the American military establishment. The question is whether the 300 American spies in Iraq caught wind of Iraq's plan to announce the possible death of Baghdadi. As a result, they may have put out their Baghdadi video to counter the Iraqi claim. Or, in an alternative view, Iraq saw the video and quickly fabricated their story that Baghdadi was injured and in Syria. Either way, it reveal's friction between the O-mericans and Maliki. It's a relationship that's not bound to get better anytime soon. I read that almost no Western nation called for Maliki's stepping aside...other than Obama. In the 3rd update in June, I quoted a news article (Iraqnews.net) claiming that ISIS's Abu Bakr Baghdadi (not to be confused with Abu Omar al-Baghdadi) was released from a U.S. prison in 2008, but the U.S. military says the release was in 2004: "According to Department of Defense records, al-Baghdadi was held at Camp Bucca as a 'civilian internee' by US Forces-Iraq from early February 2004 until early December 2004, when he was released. A Combined Review and Release Board recommended the 'unconditional release' of al-Baghdadi and there is no record of him being held at any other time." Is this inconsistency important? The Independent adds to the inconsistency: "With black hair and brown eyes, a picture of al-Baghdadi taken when he was a prisoner of the Americans in Bocca Camp in southern Iraq between 2005 and 2009, makes him look like any Iraqi man in his thirties." Whose telling the truth? And how much should we trust anything we hear on ISIS's Baghdadi if the only known photo of him (supposedly) was released by the U.S. military in Iraq? In March 2007, the Interior Ministry of Iraq claimed that [Omar] al-Baghdadi had been captured in Baghdad. This was reported by AP and picked up by the likes of CNN, whose report stated that another insurgent had positively confirmed al-Baghdadi's identity. The U.S. military denied that al-Baghdadi was in their custody, however, and one day later Iraqi officials retracted their statements regarding his arrest. Indeed this back and forth announcement of capture and later retraction occurred three times in the space of one week. Then one month later, on May 3, 2007, the Iraqi Interior Ministry announced that al-Baghdadi had been killed by American and Iraqi forces north of Baghdad. However, in July 2007, the U.S. military declared that al-Baghdadi had never actually existed and was, for all intents and purposes, a myth [Wikipedia's article on this Baghdadi tells this story too]. A reportedly high ranking "Al Qaeda in Iraq" detainee identified as Khaled al-Mashhadani, then claimed that al-Baghdadi was a fictional character created to give an Iraqi face to a foreign-run terror group, and that the "Islamic State of Iraq" was a "virtual organisation in cyberspace" created by al-Qaeda in Iraq leader Abu Ayub al Masri. The person claiming to be Baghdadi continued to release video and audiotapes attacking U.S. occupation of Iraq, but refused to show his face. The Independent article quoted from above claims that Baghdadi, the supposed leader of ISIS today, arose shortly after the other Baghdadi, and Masri, were killed together. Supposedly killed, supposedly killed together. Perhaps the U.S. decided that, due to threatening complications, the two faked monsters needed to be scrapped and replaced by the Baghdadi that has come to rule ISIS. Warplanes carried out multiple bombing raids in the northern Iraqi city of Mosul on Sunday (local time), a day after the leader of a powerful Al Qaeda-inspired militant group appeared online in a video from the city's main mosque. Residents of the city, reached by phone, said airstrikes shook the city at least three times Sunday, starting at dawn. It remains unclear what force carried out the airstrikes. The US Defense Department said it had no knowledge of the airstrikes and that US forces were not involved. An Iraqi government official in Baghdad said he had no information about any airstrikes near Mosul. ...A pro-government news website said dozens of Sunni militants from the Islamic State were killed in an airstrike [no date provided] on a presidential palace compound in north Mosul. ...On Sunday, a spokesman for Iraq's military told reporters that Iraqi forces were studying the video and had yet to reach a conclusion on whether the man in it was, indeed, al-Baghdadi. But the SITE Intelligence Group, which closely monitors extremist groups in the region, confirmed that it was al-Baghdadi. One can see the slant of this article, seeking to convince that Baghdadi's video is authentic, and meanwhile leaving out the statements, that other media are carrying, from Saad Maan, claiming that Baghdadi was injured. What horse feed is it that doesn't even make mention of that claim, whether true or false? The WP article is dated Monday, but Maan's statements were out by Saturday or Sunday for all the Washington Posts in the world to read. The Washington Post doesn't want Americans to know that Iraq claims to have injured or killed Baghdadi, does it? The Iraqi government has a choice to make, to verify Maan's report, or to counter it. Maan is in charge of the Interior. Other articles are repeating AP: "A senior Iraqi intelligence official told The Associated Press on Saturday that an initial analysis indicated that the man in the video was indeed al-Baghdadi. The official spoke on condition of anonymity because he was not authorised to brief the media." It's all media playing follow the AP leader. What good is it to quote an anonymous person in this case, without details as to why he/she thinks it really is Baghdadi. Is it merely because the man in the video matches the U.S.-prison photo of Baghdadi? Wow, is that ever hard evidence. And AP offers no comment whatsoever on the claim. The AP article likewise fails to mention Maan's claims. Maan's claim is that it cannot be Baghdadi on Friday because he was injured before Friday. Shouldn't that be a part of the AP and WP stories? Of course. What game is the United States playing? Whatever it is, it's playing it on Maliki, and this will force the Iraqi leader closer into the arms of Iran and Russia. The Ministry of Interior said on SATURDAY [caps mine] that the video which was posted on the Internet of the man claiming to be Abu Bakr al-Baghdadi, the leader of ISIL in Mosul, is a fake. The Ministry spokesman, Brigadier Saad Maan said in a statement reported by Reuters that "the man who appeared in the video is not al-Baghdadi, certainly," adding that "the ministry has analyzed the recording and concluded that it was a fake." The sites belonging to the terrorist organization of the Islamic State of Iraq and the Levant published earlier on Saturday photographs and a video clip of the leader of ISIL, Abu Bakr al-Baghdadi, delivering a sermon during Friday prayers in one of the mosques in Mosul. The International Parliament for Security and Peace announced, yesterday, the escape of al-Baghdadi to Syria after being hit badly by a raid in the west of Anbar. The video can be accessed at the webpage above. Note that while the "International Parliament for Security and Peace announced, yesterday, the escape of al-Baghdadi to Syria," the O-media in America is failing to mention, if only for debate purposes, this very-important claim. The failure is itself a story. Baghdadi is maybe dead, but barely anyone carries the story. At least, I don't know what's going on on television, but Internet news is very quiet on this claim. As the Iraqi government has said that it yet needs to decide whether the man on the video is Baghdadi, it's actually sending out the message that he wasn't killed or escaped into Syria due to injury. That is, if he was injured and gone, what's there to decide? But the claim to injury still deserves media attention for obvious reason. It can be surmised that the Americans in Iraq are hashing things out with the Maliki people as to what Iraq will, or will not, announce publicly / officially on the authenticity of the video. The Americans can table some subtle threats if the Iraqis are in the process of publicizing the "wrong" message, which can explain why Iraq has yet to make an announcement. This all has the look of the Americans wanting their ISIS monster surviving and ballooning to a greater size...while Maliki wants it to appear dying. (IraqiNews.com) According to Iraq news TV network, Al Sumaria, a representative of the International Parliament for Safety and Peace revealed, on Friday [the supposed day of the video event], the escape of the leader of the organization of the Islamic State of Iraq and the Levant, Abu Bakr al-Baghdadi to Syria after he was seriously injured in a raid in the west of Anbar. IraqiNews.com has not verified this claim reported by Al Sumaria news. According to Al Sumaria news, the representative of the International Parliament in Iraq, Dr. Haidar al-Shara said, in an interview that "The Iraqi security forces carried out an operation in the city of Qaim on the border with Syria based on accurate intelligence and with the help of the Air Force where the leader of ISIL, Abu Bakr Al-Baghdadi was seriously injured." Shara added that "after being hit, al-Baghdadi, with a range of elements of his organization fled into Syrian territory because of its proximity to Qaim," indicating that "al-Baghdadi might be killed as a result of the severity of his injuries." According to Al Sumaria TV the Iraqi security sources speculated earlier today, Friday, that the injury of the leader of ISIL, Abu Bakr al-Baghdadi was incurred by aerial bombing carried out by Iraqi troops on Wednesday night, in Qaim in west of Anbar. Wednesday night. It seems a very fruitless thing, subject to embarrassment, to claim that Baghdadi was seriously injured, if untrue. What good would it do Maliki, since Baghdadi can appear at any time to prove that he is well? The timing of the video may be such that the Obamericans are trying to "prove" that Iraq did not get its facts straight. The Telegraph announced that the "Iraq government" denied the authenticity of the video on the day it came out: "On Saturday the Iraqi government denied that the man in the video was al-Baghdadi, sticking by its claim that he had been wounded in a military operation." The Americans may then have rushed in to cause the government to suspend that claim until further notice. The first Iraqi parliament session to choose new government leaders failed to last more than an hour when the Kurd and Sunni representatives walked out on the Shi'ites because the latter were unwilling to advance another man to replace Maliki. It's to be taken as good news for Maliki and his supporters because the Shi'ite side is standing behind him to date. The next session of parliament has been postponed until August, and so it looks like a long haul before we find whether Obama gets to defeat Maliki. In the meantime, Maliki can play his games and perhaps even publicly expose the Obamerican game. Certainly, if the game is to use an over-ballooned ISIS monster to get manipulating fingers into Maliki's Iraq, then the last thing the O-merican military wants the world to hear is that Iraq injured and possibly killed Baghdadi. President Sisi of Egypt has come out to oppose Kurdish independence, which tends to place him on the Maliki-axis side of things. In fact, Sisi's statement speaks against the Sunni tide: "The comments from Sisi indicate a growing fear in the region that the division of Iraq could further empower the insurgents from the Islamic State of Iraq and the Levant..." This position is in line with prophecy that has the anti-Christ attacking Egypt. that is enough in itself to prove the hoax.